This satisfying, sweet and savoury dish is pudding and cheese course in one. Peel 3 strips of rind from the lemon; leave the pith behind. Put in a large pan with the honey, herbs, spices and wine; bring to the boil. Simmer for 5 minutes. Add the quinces, topping up with water to cover if necessary. Put a lid on, return to the boil, then turn down the heat. Poach for 20–45 minutes until tender, turning once. Remove with a slotted spoon and transfer to a bowl. Take out the spices and herbs and boil until reduced by a third and slightly syrupy. Leave to cool – it will thicken further. 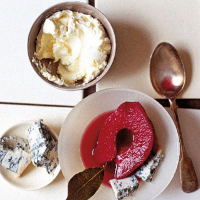 Serve half a quince per person, with some syrup and the cheeses.